This guide will provide step by step instructions how to create AWS Cloud Formation stack containing IBM MQ cluster using template prepared by us. 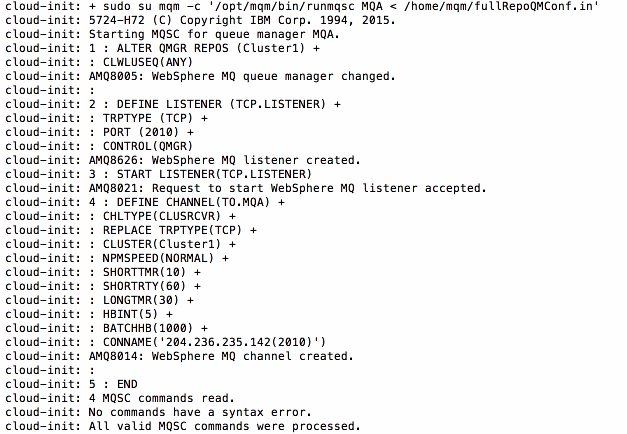 Being able to install your IBM WebSphere MQ licensed and ready to go in the cloud is a great thing. Here you can find our IBM MQ image which lets you do it with just a few clicks. But in real world scenario having IBM MQ running on just one Amazon EC2 instance is not the best solution. 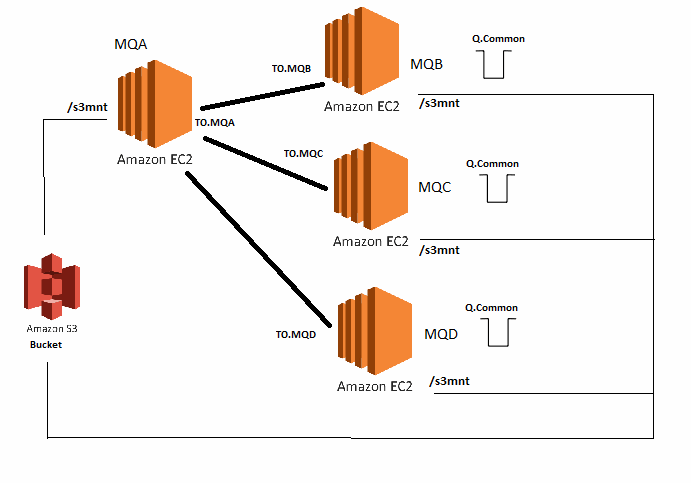 To make your IBM MQ architecture better for high availability and enable workload distribution and dynamic routing of messages received by Queue Managers you need ability to have multiple instances of a queue, you need a cluster of Queue Managers running on different machines (EC2 instances in the cloud). And this is the reason we decided to prepare AWS Cloud Formation template to help you create your IBM MQ Cluster architecture based on our IBM WebSphere MQ base image. AWS Cloud Formation stack that you will create by using our template contains 4 AWS EC2 instances (all of them are based on our IBM WebSphere MQ image) and 1 AWS S3 bucket. On every EC2 instance there is a running Queue Manager (1 full repository Queue Manager and 3 Queue Managers participating in the cluster with Q.Common queue). AWS S3 bucket has a shared storage role and all of the Queue Manager configuration is stored there. Click the diagram to the right to understand proposed solution better. You should now see blue “Create Stack” button on the top left corner. Click “Create Stack” and then from “Choose template” section use “Upload a template to Amazon S3” and selected downloaded template and click “Next”. 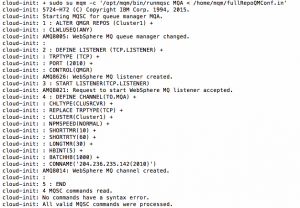 You will now have to specify a few parameters to configure your IBM MQ Cluster. – “AccessKeyID” and “AccessSecretKey” – credentials that are necessary to use AWS S3 bucket as a shared storage. You should be able to see those here. If not – please contact your AWS admin. – “BATCHHB“, “HBINT“, “LONGTMR“, “SHORTRTY“, “SHORTTMR” – all of these parameters will be used to create Channels between Queue Managers. You can leave default values or if you want to get more knowledge about it please visit IBM documentation page. Review your configuration and click “Create”Note that during the creation of stack 4 Elastic IPs are created so make sure that you can create 4 IP assosiactions at this region and of course that it is possible to create AWS S3 bucket. You will need to wait about 20 minutes to have your stack ready. When stack is created you can go to your EC2 instances list and see that there are 4 new instances initialising : Full Repo QM, Cluster QM1, Cluster QM2, Cluster QM3. From the EC2 console by clicking the “Connect to your instance” button with username “mqm“, using the previously selected .pem keyfile. See the cloud-init.log file to make sure that Queue Managers are defined and configured. You should see similar logs to the ones shown to the right (click to enlarge). As it was mentioned before 4 EC2 instances are created. All of them contain IBM MQ v.8.0.0.4. Cluster QM1, Cluster QM2, Cluster QM3 have common queue: Q.Common. they are automatically distributed to other instances. on Cluster QM1, Cluster QM2, Cluster QM3 and see that messages have been distributed . are not being sent to this Queue Manager and they are distributed to others that works fine.